The Centers for Disease Control and Prevention (CDC) estimate that in 2016, more than 64,000 Americans died from accidental opioid overdose. The number continues to rise each year and although both health and government officials have called substance abuse in this nation a crisis and epidemic, at present no definitive action is being taken to prevent even more deaths from occurring this year. 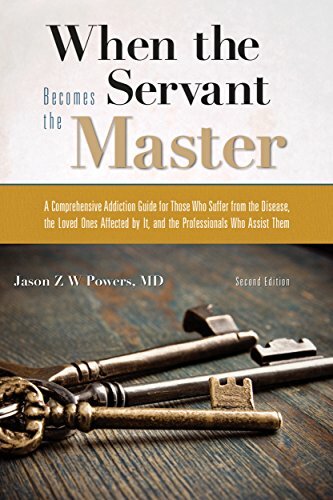 Jason Powers, MD, has stepped into that void with the second edition of his book, When the Servant Becomes the Master: A Comprehensive Addiction Guide for those Who Suffer from the Disease, the Loved Ones Affected by It, and the Professionals Who Assist Them. Through this book, Dr. Powers seeks to educate the public about addiction, busting myths and sharing the latest science in ways that are easy for lay people to understand. His goal is to help individuals better understand addiction so that they know what they are facing and the kind of help available. This is an excellent book on addiction. It covers many subjects in praiseworthy and persuasive ways. The most compelling part of the book is its effort to destigmatize addiction. Dr. Powers views substance abuse with the same calm and dispassion as one would an ear infection. This is a tremendous step forward in the discussion of addiction. In public forums, there is far too much moralizing language on the subject, which leads to alienation of addicts from families and resources. Dr. Powers’ efforts to destigmatize addiction could mean a greater willingness among his readers to get help for themselves or their loved ones. Dr. Powers’ use of language is humanizing. He notes, “The behaviors of addicts can be disheartening and there are many who have been hurt by those with addiction. Rather than minimizing an addict’s responsibility for his or her behavior, recognizing the fact that addiction is influenced by biology can assist in improving outcomes.” It is this perspective and compassion that makes this book so useful. It is easier to help someone we see as injured or ill rather than hurtful to others and in many ways, because of bad behavior, monstrous. The science of addiction treatment is fast-changing and at times can be complicated for addicts and their families to understand. After peeling away the stigma associated with addiction, Dr. Powers addresses the science of addiction and addiction treatment. He’s honest in stating that there is a lot that we do not know about addiction treatment and new practices are constantly being developed and used. He also lays bare in clear terms what we do know, for example that treatment of less than 90 days in duration usually provides sub-standard results. By writing about the science of addiction treatment in plain language, he’s able to clarify the information necessary for addicts and their families to make informed decisions about treatment. The book also does an excellent job of explaining the developing brain science that is changing how we treat addiction and thoroughly discusses the various types of drugs people commonly abuse. These are two subjects that are important for families, to help them understand the compulsive and often hurtful behaviors that addicts exhibit. Although the book is about substance abuse, Dr. Powers also includes a section on process addictions such as gambling. While he does not discuss these problems in depth, they can be and are treated similarly to substance use disorder. Dr. Powers is a patients’ rights advocate. He writes, “when addiction is accepted as a disease, health insurance will be forced to pay adequately for proper treatment.” (Emphasis his.) Books like When the Servant Becomes the Master are important for building the evidence-base that can be used to pressure insurance companies into treating all medical disorders equally. The one criticism that can be made of the book is that since Dr. Powers is a physician, the book takes a distinctly bio-medical view of addiction. There is an emphasis on medication-management therapies, which remain controversial among some groups in the addiction treatment field. There is also a lack of discussion of the wonderfully useful complementary and alternative medical (CAM) practices that can treat addiction when used in conjunction with psychotherapy, and can also lead to radical life transformation for addicts and their families. The lack of information on CAM practices and the impact they have on life satisfaction is a significant deficit in this book. Overall, Dr. Jason Powers’ second edition of When the Servant Becomes the Master: A Comprehensive Addiction Guide for Those Who Suffer from the Disease, the Loved Ones Affected by It, and the Professionals Who Assist Them is a must read for physicians, law enforcement, all those involved with creating public policy on substance abuse related issues, and of course, families looking to understand substance abuse and how to find quality treatment for their loved ones.